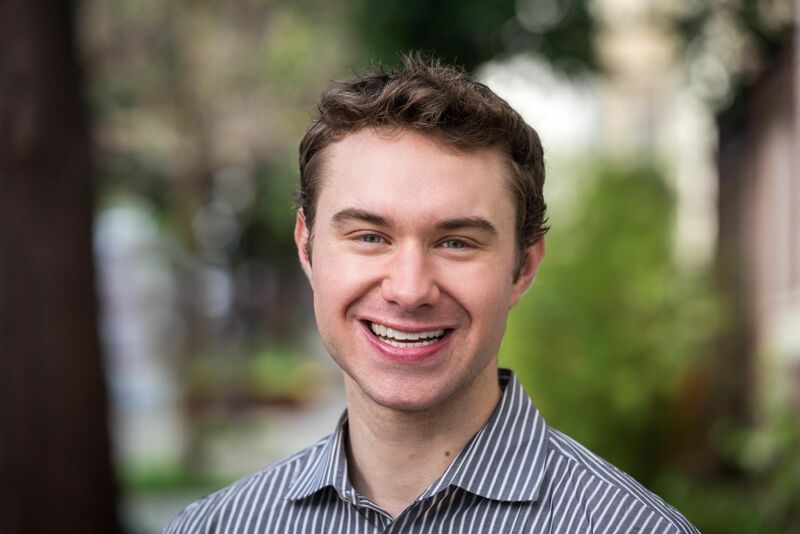 People that know me well might describe me as a “productivity and time management geek.” This is true – I read about these topics for “fun,” and I’m constantly tinkering to squeeze more out of each day’s limited time and focus. One of my favorite areas of experimentation is my morning routine. This column ties two important threads together from my book, Bright Spots & Landmines (free PDF, Amazon), and also shares a third strategy I’ve just added to great effect over the past month. This morning routine has brought more “Bright Spots” thinking, more mindset predictability, and less stress to my days. In turn, that helps my diabetes, since stress can cause higher blood sugars and higher blood sugars can cause stress! Plus, building Bright Spots analysis into my days – via #1 below – helps combat the urge to only focus on the negatives. 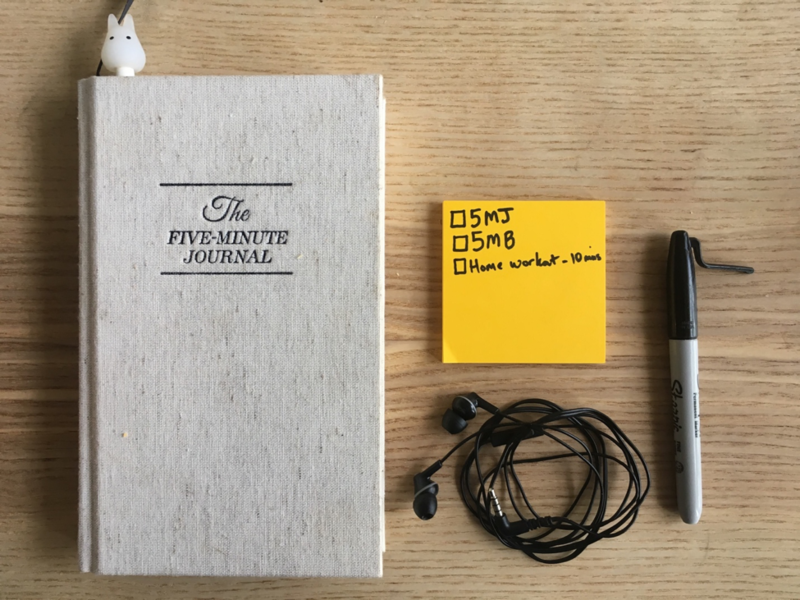 In the Mindset chapter of Bright Spots & Landmines, I talk about using the Five Minute Journal (www.intelligentchange.com), a tip I picked up from author Tim Ferriss. This little book has made me happier, less stressed, and more reflective and grateful every day – it’s easily the best $23 I’ve spent in a long time. I now start and end the day in a more positive and reflective mindset. Each page in the journal corresponds to a day, half of which is dedicated to the morning and half to the evening. As the enclosed page shows, the questions are easy to answer – the morning questions set the tone for the day, while the nightly questions recap what went well (Bright Spots) and could have been better (Landmines). I usually end up writing at least one actionable health-related thing I want to do or wish I had done that day (e.g., take a bike ride, snack less, etc.). I have tried “gratitude” apps in the past – given the strong link to greater happiness and joy – but none ever stuck. This handwritten journal has me hooked, and I have barely missed an entry in the 18 months of using it thus far. On tough days, it’s also fantastic to thumb back through the journal and realize how many good things I have going in my life. Bright Spots are easier to find when I’m recording and reviewing them! I keep the journal on my kitchen table now as a reminder to fill it out in the morning (while I drink tea) and the last thing I do before sleep (as I write the Post-It note described below). I really try to vary my daily answers to the “I am grateful for...” question; otherwise, I end up putting the same few generic things every day. Buy the journal here. 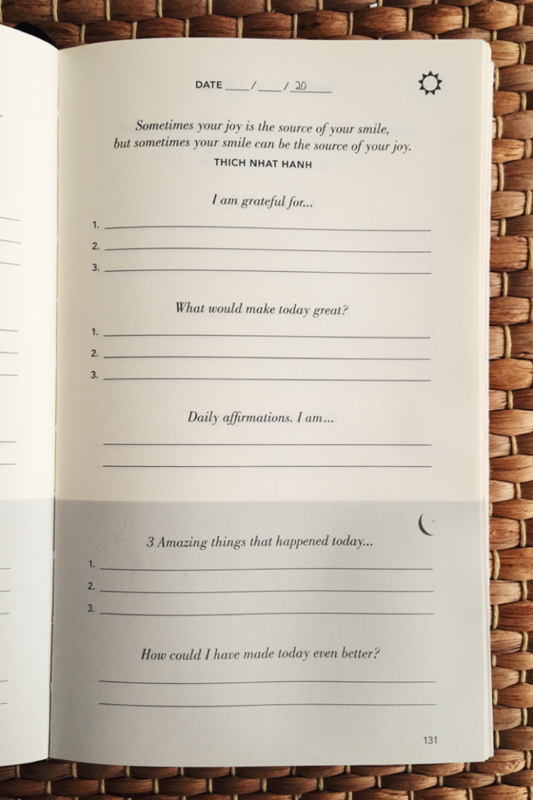 After filling out The Five Minute Journal, I aim to breathe for five minutes every morning. I find it reduces my stress levels throughout the day, which is valuable for diabetes – stress can cause higher blood sugars, and higher blood sugars can prompt stress. I find mindfulness helps with both. I use the free app called Calm (Android, Apple), put headphones on, and listen to the rain sounds. I use “Timed Meditation,” which only includes the nature sounds and a finishing bell (i.e., no guided voice). Of course, your audio preferences may vary! My goal in this exercise is not to “clear my mind” or “think about nothing,” but to practice attention and present-moment awareness. (Most of my stress comes from worrying about the past or future.) When thoughts wander – and they do in 100% of sessions! – I bring the focus back to breathing in and out. To minimize distraction, I always have my phone on Airplane Mode or “Do Not Disturb” in the mornings. If I have extra time, I might go for ten minutes. However, five minutes is always the goal because it makes the routine feel achievable; otherwise, I’ll boldly aim for “20 minutes” and do a grand total of ZERO. Success = sitting down and doing this for five minutes. Mindfulness has been strongly linked to lower stress, lower blood sugars, less depression, lower blood pressure, weight loss, and more – see a great review article focused on the diabetes implications here. In a study published last month, researchers found that mindfulness had “a remarkable improvement” on emotional wellbeing and glucose levels (A1C, fasting blood glucose) in people with type 2 diabetes. For me, this small practice alone has trained my brain to notice more of the mental chatter and distraction in day-to-day life. In those moments, I can more quickly spot unproductive questions and negative thought spirals. Then, I go back to whatever I’m doing. This Post-It note approach is the newest addition to my morning routine toolbox. 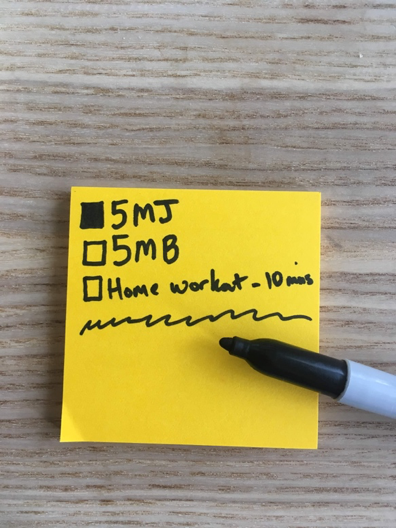 Under those two boxes, I’ll add a third [ ] with my exercise goal for the day – 10-20 minute home workout on Monday/Wednesday/Friday or riding my bike on Tuesday/Thursday. Critical step: I then arrange everything for the morning: I put the Post-It note, my headphones, and The Five-Minute Journal next to each other on the kitchen table. This step is vital – changing my environment – as it significantly increases the odds of success in the morning. When I wake up, I make tea, sit down at the kitchen table, and color in the boxes as I complete the morning routine. (Adult coloring is now mainstream, right?) This has had a larger-than-expected positive effect on my psychology – checking things off in the first few minutes of the day builds momentum. Plus, if nothing else goes right the rest of the day – diabetes landmines, I’m looking at you – these small morning victories are meaningful. 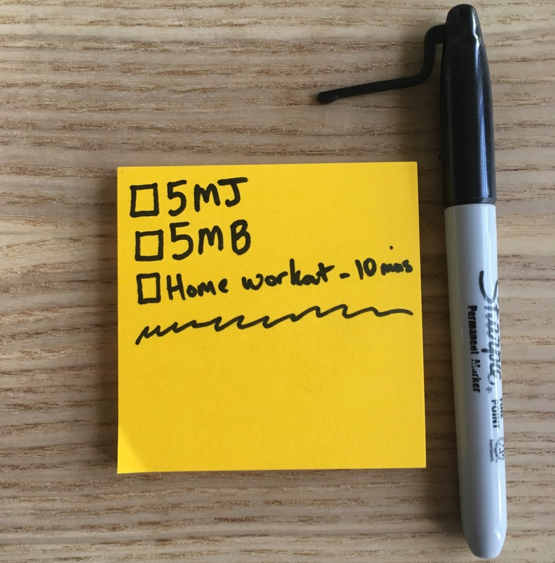 Importantly, the Post-It note does not include things I’m already going to do automatically – e.g., walk my dog, brush my teeth, etc. I limit it to things that make an impact on my day, but are easy to skip. I’ve tried a gazillion to-do list and goal setting apps and programs, but the physical act of handwriting has really made a difference here. 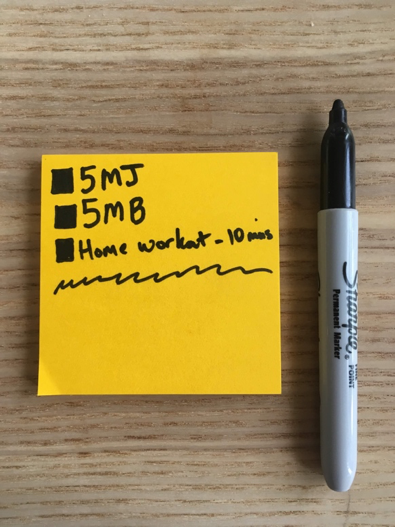 The other keys are making the routine seem achievable – five-minute tasks, fit on one Post-It note – and arranging the environment for success. So far, this has been working really well for me! While this morning routine above is a goal – and two five-minute tasks feels very doable – it doesn’t happen every day, especially on weekends and while traveling. But when I do complete The Five Minute Journal and five minutes of breathing, it seems to reduce my stress levels, improve my ability to deal with unpredictable days, and boost my positivity. Given the 42 factors that affect blood sugar, a lot of diabetes can feel out of my control, even using the strategies shared in Bright Spots & Landmines to conquer these factors. It’s easy to see unexpected blood sugars and feel frustrated, stressed, or beat myself up. This morning routine imposes a tiny mini-world of control, a small victory in an often stress-inducing condition. Where stuff is located in my environment can drive meaningful changes in behavior. I encourage you to keep experimenting with your morning routine. Do you have one? Does it make your days go smoothly? On days when you complete your routine, what happened and how can you replicate it? Please send us an email with your feedback – we love hearing from diaTribe readers! You can also reach out on Facebook or Twitter. mmol/L version: free PDF, on Amazon UK, and on Amazon Canada.